Materials: Silicon, GaAs, SiGe, etc. Machine: Disco, K&S, TSK, etc. 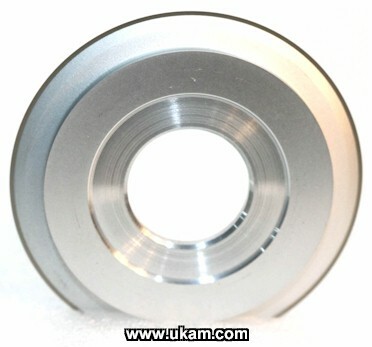 UKAM Industrial Superhard Tools proprietary blade manufacturing processes, which allow precise control of diamond grit size, diamond concentration, and nickel bond hardness, are used to optimize these variables and produce hub blades that offer unparalleled cut quality, blade life and throughput. SMART CUT™ series Nickel Bond Hubbed diamond dicing blades provide excellent performance on large variety of applications ranging from silicon dicing, very brittle III-V compound materials, PZT ceramics, tantalates, aluminas, to silica filled plastics for chip scale package singulation. SMART CUT™ series Nickel Bond Hubbed diamond dicing blades consist of a precisely made hub, shaped for optimum cooling results. The hub carries an electrodeposited layer of proprietary nickel alloys and diamond grains. When the supporting aluminum is etched back, a free standing nickel diamond matrix remains. The length of this free standing (exposed) diamond rim determines how deep the blade can cut. Please see formula below for more information. Maximum thickness of the plated Nickel bond diamond layer (measured across the diamond peaks). Blade thickness ranges from 15 to 65 microns for fine diamond mesh sizes. 30 to 130 microns from medium mesh sizes and 80 to 350 microns for coarser diamond particles. Blade thickness to be selected is the cutting street width of the substrate divided by 2.2 to 2.5. Blade thickness should be based on street width and required distance from the edge of the street toward the kerf, within which chipping, cracking or other defects are not acceptable. For Example: Exposure for a 600 micron substrate cutting into tape is 30 + 600 + 130 + 200 = 960 microns. Recommended maximum blade exposure is about 25 x blade thickens for soft nickel alloy bond and 35 x blade thickness for hard nickel alloy bond. Excessive exposure can cause number of problems such as blade wobble, wider kerf cuts, increased blade wear and unacceptable cut quality. for cutting very thick materials such as multi layered ceramic capacitators (MLCC). 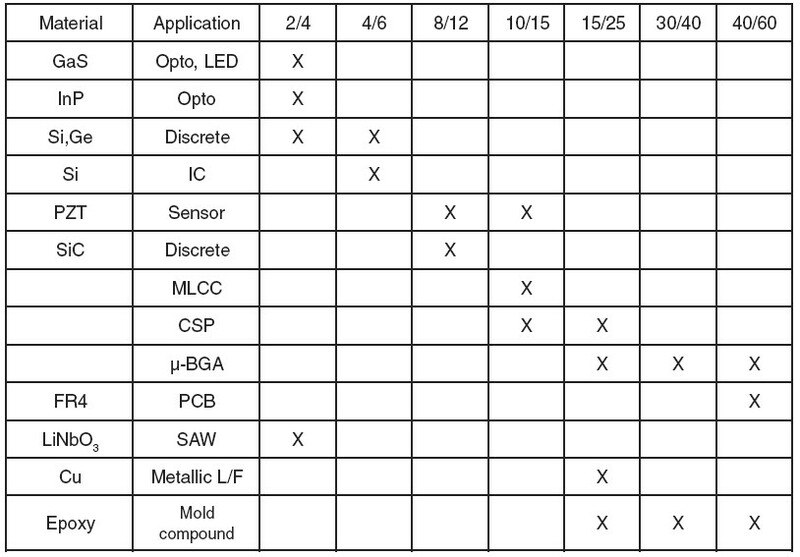 Recommended diamond size for these applications 15 to 25 microns. Bond hardness determines how fast the nickel bond dicing blade will protrude/release its sharpest point of diamond particles in order to maintain consistent cut quality. Smoothness of diamond abrasive particles of the substrate, without considering diamond grit size is influenced by the stability of the bond binder. 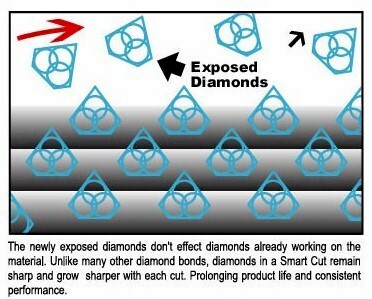 As the diamond particles become dull during usage, the speed and force required for their release from bond matrix. depends on strength they are bonded with. Hard nickel alloys firmly hold diamonds in place. They typically wear less and hence have little self sharpening. Softer nickel alloys on the other hand release dull diamond easily. And more frequently expose continuously sharp diamond particles. For this reason they are more self sharpening. SMART CUT™ series Nickel Bond Hubbed diamond dicing blades are available in soft or hard nickel alloys depending on customers dicing objective of clean cut quality vs. long blade life. Nickel hardness and size of diamond particles plays a major role in determining cut quality, feed rate, RPM's, blade life, and overall performance. Finer diamond particles produce very smooth cut quality, along with minimum kerf less, and most minimal amount of chipping. Smaller diamond particles are release from bond faster, exposing new sharp diamond particles and maintaining excellent cut quality. The trade off is lower blade life and much slower cutting speeds. Since smaller/finer diamond particles remove less material, they require higher spindle speeds and slower feed rates. Finer diamond particle nickel bond dicing blades, also tend to load up (clogging diamond particles cavities with material residue being cut). Coarser size (larger) diamond particles provides much higher feed rates. 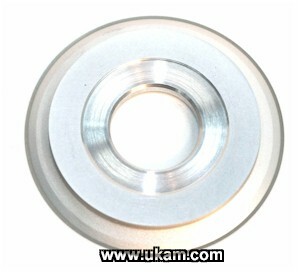 Coarser diamond nickel bond dicing blades provide longer life and exhibit very little tendency to load up. The trade off more chipping, greater kerf loss, and rougher cut quality. 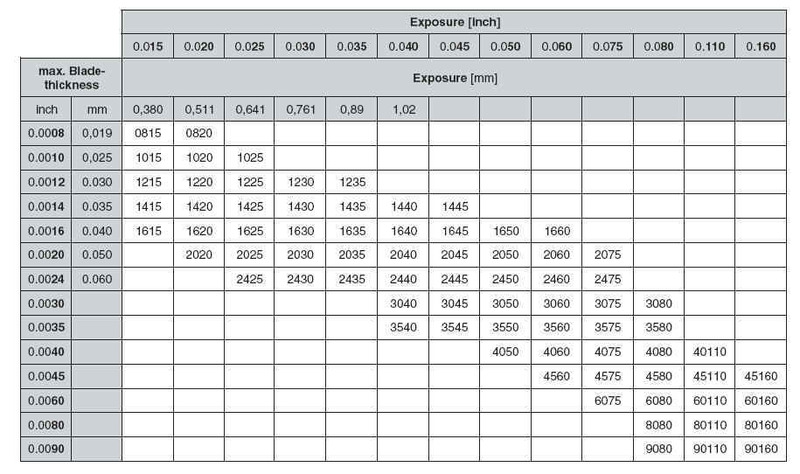 SMART CUT™ series Nickel Bond Hubbed diamond dicing blades are available in large variety of diamond particle sizes, please see table below for more information. Recommended for soft ceramic substrates, PCB's, BGA's, and some metals. 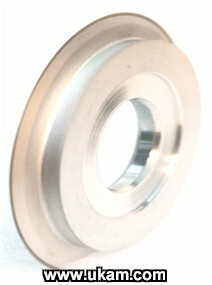 For these applications coarser diamond particles are embedded into nickel. SMART CUT™ series Nickel Bond Hubbed diamond dicing blades are pre-dressed at the time of manufacturing. Dressing is the final step of the SMART CUT™ series Nickel Bond Hubbed dicing blades manufacturing process. This process levels the abrasive/diamond particle surface by removing extended diamond and plating protrusions. Pre-dressing is done in a way to best fit your anticipating dicing requirements/application. However, we still recommend dressing the blade prior to use on your own dicing equipment. Doing so will help you achieve optimum blade roundness and eliminate pulsating peaks of grinding pressure, and prepare the blade for the needed cutting depth. Many users gradually break in their nickel bond hubed dicing blades by first making few trial cuts in order to verify acceptable performance/cut quality and proper alignment of optics and coolant on their saw. Consequently, they start cutting material at slow speed and gradually increase the speed and feed rate step by step towards their required feed rate. Blades are individually packaged in clear plastic cases. Each dicing blade box holds 4 individually packaged blades. Typically minimum order is 4 pcs (this applies to samples as well). Unless the specifications is very popular.